The SDR people that are on the front lines doing the work of the Lord are asking all that frequent the site and conference rooms for prayer at this time as the SDR people are under attack more than ever before. Please pray the Lord blesses us as His obedient people in the Lord with the faith, wisdom, discernment and physical means to be able to proclaim the loud cry more effectively in the coming days as normal routes of evangelization are being locked down and censored more so now than ever before. Yes, it is prophesied to happen to God's people and so it will. We have no problem trusting our Father who has warned us that most will hate the truth we share and so we must be prepared for whatever comes our way. But this means we must also pray just as much as the people of God did long ago right before prophesied events were about to fulfill in their day. We have a mighty work to do brothers and sisters and as we know, no government approved preacher or pastor will be called of God to do this task any more than an apostate Pharisee would be called 2000 years ago to declare before all that Jesus Christ was the Messiah. All those that have joined with the second beast of Revelation (the USA) in their long prophesied 501c3 contracts have created the image of the beast in Rome just as the Lord declared they would. And so they as well as the government they worship, have been moved by the dying god of this world to shun, persecute, censor and even threaten the obedient bride of Christ who has been moved by the Holy Spirit to perform the task the apostate leaders were prophesied to put down so as to clamor after the riches of this world. But now the attack has escalated! As you all know, 2 Weeks ago I made a video showing how YouTube finally admitted in writing to censoring Christian videos even if they committed no crime or broke any YouTube policy. (I actually posted a video of this happening back in 2015) This is why even though I have thousands of subscribers, the hits to the videos the last few years alone have been much lower than they should be. Then on Wednesday evening of this week I discovered YouTube was now doing strange things with my subscriber numbers, and I caught them doing it LIVE! If you watch the short video I made on that you will see how the numbers kept bouncing back and forth to the tune of about 1100 subscribers apart. By Thursday morning I saw 1186 subscribers deleted from my account. And yes, the numbers have continued to drop since then, but not as fast. On top of all this, as I was discussing this chain of events with Pastor Craig yesterday and he reminded me that many of his videos were also deleted from his YouTube account recently! And then to add insult to injury, I got an email from a brother in Poland who told me that my website was loading at a snail’s pace in his country. As we all know, crippling the download speed on any website is a sure fire way to get people off the site. At first I blew it off as a possible ISP issue on his end; but then I dug into my past alerts from brethren around the world who have been telling me the exact same thing as well as alerting me that my website is showing up as a "dangerous site" on most nations outside of the USA. Check out this pic a brother in the faith sent me from the UK recently. 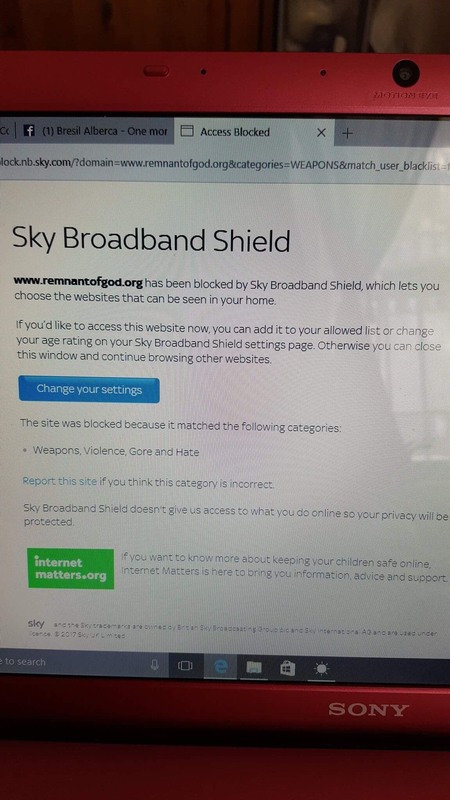 They are actually lying to the people claiming poGm, a Christian website no less, is now being flagged for "Weapons, Violence, Gore and Hate! Worse yet, China's national firewall software, which is used in all Dlink Routers in the USA, declare poGm to be a terrorist website when parental controls are put on! And all of this started happening around the same time I discovered the poGm main site went from averaging over 4 million hits per month to 1.5 to just barely over 2 million a month. And yes, that was when Goggle began to censor me. Compile all that with the reports coming in on a regular basis about censoring of my site and others in the SDR faith by Google and other online search engines, ISP's and free email providers as well as the blackballing of my emails that causes them to be deleted or tagged as SPAM on tens of thousands of ISP's, this shows we are most assuredly under a coordinated attack by the dying god of this world. So again.. I implore all of you to please pray the Lord sends us the means and wisdom to do the work that is very effective online and especially offline wherein they have very little control. And PRAISE THE LORD! Attacks like this only come because we ARE doing the work that glorifies the Lord and helps souls find their way to His loving arms. I just got word that my video titled "YouTube: No FREE SPEECH for Christians!" was manipulated in some way by YouTube. I don't know when or how they did this, but if you're deaf and want to use the subtitles in English, which is the norm for ALL my videos seeing how I am located in the USA, YouTube somehow changed the native language on that one video to DUTCH! And just so you know, I never once in all the years of posting YouTube videos have ever had to pick "English" as the native language for the videos or even subtitles. English was always the default. But YouTube changed it on that one video that exposes them as the culprits behind censoring Christians. And by the way, when I discovered what they did, I went to the video manager for my channel and speciffically selected ENGLISH for the subtitles. But if you click the video link now and then click subtitles it is still playing in DUTCH! I even went so far as to force the "auto-generate" option in the video play bar (with the gear) to English and still, it plays in Dutch.